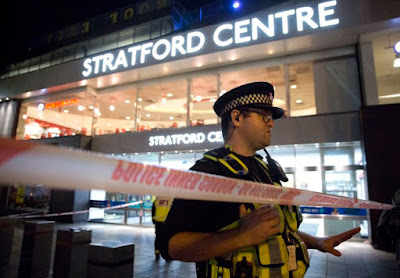 A 15-year-old boy has been arrested after a horrific ‘acid attack’ in the Stratford Centre last night. Six people were injured after the noxious substance was thrown in the middle of the busy shopping mall in east London last night. Three of the victims had to be rushed to hospital after being hit with the substance, during an apparent ‘altercation’ between two groups of males. Horrified onlookers reported scenes of panic in the aftermath of the incident, which was first feared to be a series of random attacks. One witness described seeing a young male victim screaming in pain as his friends shouted ‘it’s an acid attack, he’s burning!’, while others rushed to wash the substance from their skin. 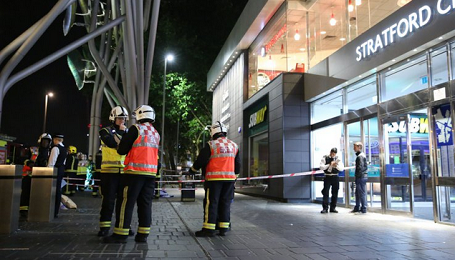 The teenager was arrested on suspicion of causing grievous bodily harm. 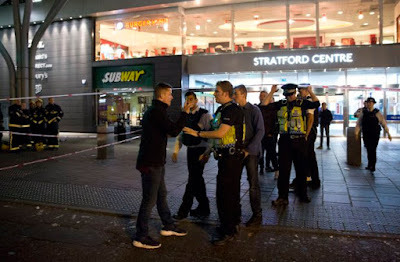 Scotland Yard said the altercation happened just before 8pm on Saturday evening: ‘During this incident a noxious substance was thrown. When the liquid was thrown, both groups ran from the scene. Witness Imran Tahir Rizvi said he overheard the friends of one victim, aged 18 or 19, shouting about an ‘acid attack’, then saw a young man lying on the floor screaming of a burning pain. He also shot a video, which showed a man sitting on the station floor ‘crying [and] shouting in pain’ while surrounded by paramedics.